I love organizing. Obviously. In my own house, in other people’s houses, in my car, in my mom’s pantry (something I tackle pretty much every time I visit my parents). When I’m feeling anxious, or when the hamster wheel that is life with four small children is getting the better of me, my best medicine is five minutes to rework a problematic drawer in my kitchen. I feel instant relief and an immediate sense of accomplishment and productivity. I realize this may sound odd… my husband certainly thinks so. But it’s who I am and it’s why I’ve chosen a career that allows me to do things like get a serious rush from turning a seemingly useless space into the perfect place for a client to keep her brown paper grocery bags (true story… we may have even hugged over it). There is no basement too dirty, no closet too packed, no kitchen too puzzling for me. I love it all. My children’s clothes. Oh, the clothes. You can see why this is the one organizing task that can make my head spin. But, it’s got to get done. So, here are a few tricks I’ve learned along the way to make it slightly less painful. Take the too-small stuff out of rotation right away. Keep a bin, laundry basket or drawer in a convenient location to continually toss-in clothes that are too small. They can get sorted when it’s time to pack them away, but pulling stuff out of rotation regularly avoids having to search through crowded drawers every day to find what actually fits. Deal with one kid’s clothes at a time. If possible, avoid the mental overload of taking out all bins of clothes belonging to all kids and trying to do it all at once. Work with one kid’s bins/drawers at a time. Believe me, I’ve tried doing a massive overhaul and I succeed at little except creating a strong desire to get rid of everything they own and have them live in undershirts and sweatpants. Doing one kid at a time will help keep the stress low and the efficiency high. That’s the winning combo! Label label label! As you pack stuff into bins, you may think you’ll remember what’s in each one. You won’t! Label the size range, season, and any extra notes (like Christmas PJs 2020, or 4th of July shirts for Summer 2021). If you don’t have a label maker, stick a piece of paper on the inside of a clear bin, facing out. Bonus points for labeling 2 sides of a bin so you can store the long or short way! Don’t overthink it. If a 3T shirt ends up in the 5T bin and therefore never gets into rotation… oh well. We’re not moving mountains here, just trying to dress kids in (roughly) the appropriate size and season threads. The goal is getting sizing and seasons together, but if things get missed here and there, don’t sweat it. Efficiency is more important than getting it perfect. The stuff that’s too small for the last kid(s) leaves the house! Whether you’re donating, passing things along, or tossing the stuff that’s too stained and thread-bare for either… get it out! Most people have a tendency to spend weeks tripping over donation bins or driving around with them in their cars for an eternity. Drive it right on over to your friend’s house or the local family shelter or wherever it’s going and get it out! You’ll feel great about having the un-needed stuff gone, and those who need it will be thrilled to have it. OK, so now that I’ve gotten myself into the mind-set (and since we are finally seeing some hints of spring)… off I go to the kids’ rooms to tackle Matthew’s transition out of size 5 winter and into size 6 spring. Wish me luck! Always go with clear binds for clothing so you can have a rough idea of contents. This entry was posted in Uncategorized on April 18, 2019 by Avery Amante. In my last post, I talked about how every corner of my house and all aspects of how my family functions are about to change. Thankfully, I’ve looked around and decided that not quite every single space needs rehab, but they all need some re-evaluation. My own closet is an easy, fun place for me to start. It’s one of the most manageable because it’s the one place in the house that is mine-all-mine. It’s small and awkward and dark, but I’ve made it work pretty well for me thus far. The thing is, I need my closet to start working harder for me now. So far, I’ve had the luxury of using the closet in the guest room for my lesser-used clothing: party dresses, out-of-season hanging stuff, and the few remaining dress pants/shirts/suits leftover from my corporate life. But, said closet will soon be home to swaddle-blankets and burp cloths, so mine needs to go into overdrive and get ready to house some additional stuff. I needed some ways to optimize my closet space, and so I decided it was time for the hanger switch. I don’t actually remember the last time I bought hangers. The sturdy white plastic ones seem to have been with me my entire adult life and have served me well. I’ve also accumulated a small amount of wooden ones for coats and suits. I haven’t given hangers much thought. Actually, that’s the way it should be. So forgive me for asking you to spend precious minutes reading about them, but I’ve seen first-hand in my own closet just this very morning that a few dollars and a few minutes can make a big impact on your space. What I can tell you is that huggable hangers are where it’s at. If you’re not familiar with these babies, they’re slim, velvet-coated, and are designed to save space. They also help preserve the shape of your clothes, and prevent slippage (an amazing solution to those tricky-to-fold open cardigans). And they actually accomplish all of those goals. Whether you need more space like I do, or you just want to create a roomier feel on your hanging bar so it’s easier to see and flip through your clothes, these provide a quick and easy fix. There are plenty of color and shape options on Amazon, or do what I did and grab at 25-pack at Home Goods for $9.99. It’s an inexpensive and easy way to give your closet a little face-lift. My blazers, coats and suits are staying put on the sturdy, wooden hangers, but everything else is happily settled onto new, soft, velvet huggable homes. My clothes may even be ready for some new neighbors now that there’s more space! So, this organizer’s recommendation for a great way to spend a few bucks and a few minutes – take the huggable hanger plunge! Oh, and one PS… every closet revamp is an opportunity to purge – even just a little. 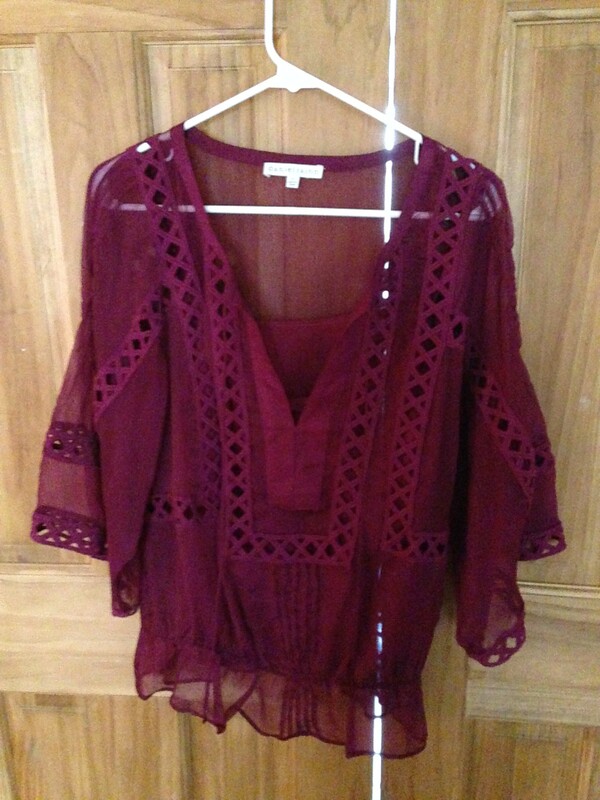 I just found a skimpy sequined gem buried in the depths with the tags still on… out it goes! This entry was posted in Uncategorized on March 14, 2017 by Avery Amante. When I tell people what I do for a living, I’m often asked “So is your house perfect?” The answer is no, it’s not. Far from it. My husband is a… well… let’s just say he has an inclination to save things (more on that later …). I have two little kids, and all the stuff that goes along with them. I myself, while committed to keeping my possessions limited and in the “useful/necessary” or “sparks joy” categories, am not a minimalist. And, life happens. Things get messy. Stuff gets put back in the wrong place. Systems that once worked sometimes fail and need to be reevaluated and revamped. Our circumstances and needs change, so our space needs to change along with them. For me, one of those moments is fast approaching. And it’s not making space for the new toys from Christmas or figuring out a better system for incoming paperwork. It’s getting my house ready for two more babies. Yup, as it turns out, twin boys are going to arrive in June and this changes, well, pretty much everything about my space. I live in a modest 1,700 square foot Cape with three bedrooms, a partially finished basement, a two-car garage, and two small bathrooms. It’s not a big house, but has felt plenty roomy for my family thus far. We even have a guest room, since my four- and two-year-old boys share and we like to have space for grandmothers when they visit to help with childcare. I’ve had the luxury of overflowing my own things into the guest room closet since my own is quite small, and also using it as a linen closet since there isn’t one in our hallway. Well, come June (or sooner! ), bye-bye guest room! Every corner of my house, every aspect of how my family functions and what we need and use on a day-to-day basis is about to change. From the challenge of linens with no linen closet to transforming my basement from a man-town/office to a guest room/play room to making space for another car (minivan, here I come! ), there are almost no corners, closets, or nooks and crannies in my house that will go untouched. And even though I do this for a living, I will admit that working in one’s own space is different. As an organizer, looking at someone’s space with a fresh set of eyes is one of our biggest luxuries. It’s harder to see alternatives and solutions in space that you use day-in and day-out. That said, I am going to have to put on my professional hat and start, room-by-room and closet-by-closet, to make real changes that will allow for two more little people to join my household. It’s going to be overwhelming and it’s going to be fun. It’s going to be rewarding too, but most importantly, it’s going to be a learning opportunity. I fully expect that along the way I’ll pick up some new tricks and tips and be able to get myself into the minds of my clients a little bit more. So stay tuned! I’ll be chronicling this adventure in the weeks and months to come. I hope you’ll read along as my ever-growing belly (better do the heavy lifting early on) and I get a little crazy here at 247 Main Street! This entry was posted in Uncategorized on February 28, 2017 by Avery Amante. Raise your hand if you dread the bi-annual seasonal wardrobe swap? Yeah, I thought so. Even me, organizer by trade who loves to sort, toss, fold, tidy… even I dread it. There is something about having to look almost every article of clothing square in the eye and acknowledge its existence that is a little bit daunting. Because, let’s face it, none of us have our wardrobe completely under control (if you do, I applaud you… and you needn’t read further). Be honest with yourself! You know yourself best. Are you someone who is going to take things to get tailored? Are you really going to spend the time on the red wine stain you got on your favorite blazer last winter? Do you really go out often enough to warrant a dozen fun, dressy tops? If the answers are yes, then by all means, keep that stuff! But, for many of us, it’s easy to fool ourselves about our behaviors. For example, I have (well, had) a maxi dress that I bought three summers ago. The top didn’t fit me right, but it was cute, comfortable and on sale (winning combo!) so I grabbed it and thought I’d just have it taken in. Well, apparently I’m not someone who takes things to get tailored. Last week, when putting away my summer clothes, the adorable dress went in the donation pile. If I didn’t bring it to a tailor in three years, it’s never going to happen. So embrace who you are, your habits and behaviors, and just know what is realistic for you. Release the guilt! If you read my post about the shirt I never wore, this may sound familiar. It’s ok to acknowledge that things you once loved and adored are no longer things you would consider wearing in public. It’s ok to admit that something expensive was a bad purchase. It’s ok to say goodbye to your ill-fitting college sweatpants or a sentimental t-shirt once it has served you well (or even if it hasn’t). I hung on to a pair of mittens that my sister knit for me many years ago because the gesture was so sweet. They itch and I never, ever wore them. I finally decided that perhaps someone else could use warm hands and put them in my donation pile. When I sheepishly admitted this to my sister her response was “What mittens?” No guilt needed. They are, after all, just clothes. Clothes should feel good! Speaking of itchy gloves, I firmly believe that life is too short to wear anything that itches. Or falls down. Or rides up. Of course we all have a few pairs of heels that make our feet scream or dresses that don’t allow for a deep breath – that’s just part of life, right? I’m talking about the clothes you wear every day. What you work, lounge, sleep, exercise and grocery shop in. That stuff should feel good on two levels; it should be fairly comfortable and you should like how you feel in it. Sounds obvious, I know. But when you take an extra second to really think about how you feel when you put something on, you may realize that you’ve been overlooking a flaw in function or comfort that has been subtly driving you crazy. I have a shirt with a pocket and a hood that I tend to put on in the evenings when I’m ready to get comfy. The wrists are cinched and have no give, so they can’t be pushed back. It wasn’t until writing this post that I’ve come to terms with the fact that the darn sleeves get soaking wet every time I do the dishes or give my kids a bath – things I do every single time I have the thing on! Wet sleeves = uncomfortable = time for it to go! So, yes, the dreaded wardrobe switch-a-roo may be a tedious and slightly painful process. But, if you look at is an opportunity to clean out and simplify, to be honest with yourself, to make decisions guilt-free, and to make sure your wardrobe contains mainly things that make you feel good, I promise you’ll like the results. And just think, when you get rid of the stuff that isn’t serving you well, you won’t have to worry about where to put a few new purchases for the season. It’s a win-win! 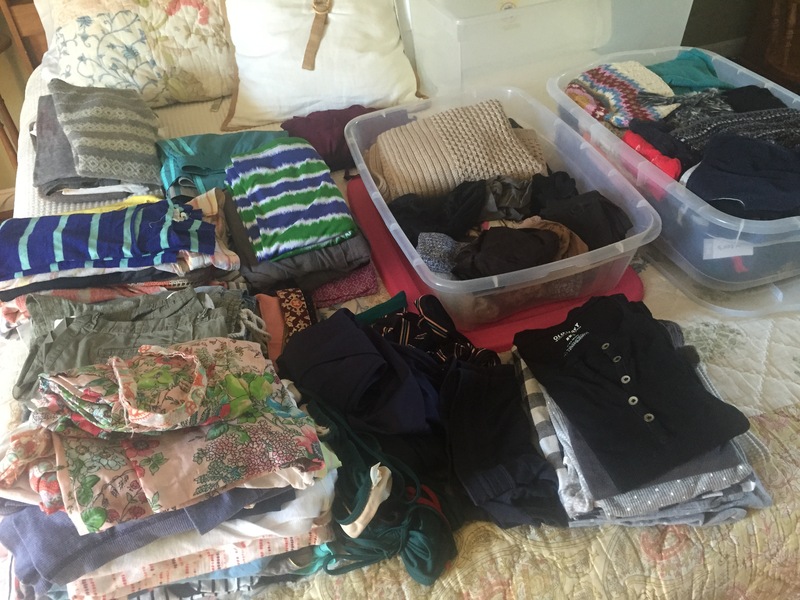 Piles, piles and piles of clothes – some will stay and many will go! This entry was posted in Uncategorized on October 21, 2016 by Avery Amante. Moving: Boxes, Bubble Wrap & Tape… Oh My! Moving is tough. It is mentally and physically taxing. It disrupts all facets of your life. It forces you to look every single possession in the eye, which can make you want to get rid of everything you own and live in an empty room (give in to this impulse at least a little bit – moving is a key time to purge!). The right supplies are key for making this process go faster and reduce casualties. For less fragile items, brown packing paper is fine (start saving it from your online orders in advance – thank you, Amazon! ), but when it comes to fragile items that are of sentimental or monetary value, or that you can’t function without (ahem, wine glasses), use bubble wrap. I recommend getting a few rolls of each size – the narrower sheets are great for glasses and small plates, the wide are key for diner place, platters and vases. It always surprises me how expensive bubble wrap is, but when you factor it in as part of your total moving costs, it’s a small percentage. And it’s worth it. Another way to make a big impact, and this time for minimal cost, is your tape gun. It’s going to be your best friend for a few weeks, so it’s important you two get along. And believe me, it’s easy to get very angry at a lousy tape gun or the disposable ones that don’t give you any leverage. Invest in a good one, like the Scotch Box Sealing Dispenser (https://www.amazon.com/Scotch-Sealing-Tape-Dispenser-H180/dp/B0002FTH66/ref=sr_1_9?s=office-products&ie=UTF8&qid=1465568478&sr=1-9&keywords=tape+gun) and some decent tape. When you’re packing, the temptation can be to start to grab at random when you have a little space for a “tuck in” object. And in the moment, you may truly believe that you’ll remember that your vegetable peeler fit perfectly into that empty spot in a box of picture frames or that your bath towels are tucked around your cake plate. Resist the urge! When you are faced with stacks on boxes on the other side, you will save yourself time and frustration if your kitchen stuff does not get mixed in with your knick-knacks and your linen closet can be unpacked separately from your china cabinet. A little empty space in a box is ok when the result is easier unpacking on the other end! If you’ve ever heard yourself saying “where did all this stuff come from? !” during a move, you are not alone. When you are forced to pull out every drawer, crawl under the beds, and reach into the far corners of your basement, the stuff seems to come out of the woodwork. It is worth taking the time to deal with the things you unearth before you throw them into a box (“hello, drawer full of old phone chargers and assorted speaker wires – do I really need to take you to my new home?”). You’ll have so much to deal with on the other end, that doing the sorting, purging, and careful packing now will make unpacking faster and easier. And while I do urge you to get rid of stuff you don’t need to take with you, you will likely still end up with more than you think. Boxes get used up quickly (especially when you’re using lots of bubble wrap and packing like-with-like, right?) – you need more that you think you do. Even me, the eight-time mover and professional organizer, was up until 3am the night before the movers arrived using empty 12-pack boxes for last-minute kitchen stuff. Not ideal – and next time, which hopefully won’t be for a while, I’ll follow my own advice! So, my recommendation – estimate how much time you need to pack and how many boxes you expect you’ll use, then add 50% to both. You won’t be sorry! As I said, moving is tough. But it can be manageable. Give yourself time, and plenty of good supplies, and I promise you’ll be able to focus a little bit more on the excitement of settling in to a new space. This entry was posted in Uncategorized on June 10, 2016 by Avery Amante. Once upon a time (or in 2009 to be exact), I spent an impromptu afternoon with an old friend who was visiting Boston from New York. We had a fabulous and nostalgic afternoon walking around the North End (where we had been neighbors) and hitting all our old haunts. One stop was a favorite boutique on Salem Street. We had already had a glass of wine (maybe two) and were in celebratory shopping mode. As luck would have it, the sale rack was brimming and offering an irresistible extra 25% off. Now, I should preface this by mentioning that I am a cheapskate when it comes to clothes, and I’m a sucker for a good sale. So of course I made a beeline for the deals. I flipped through the trendy, colorful selections looking for something that was both my size and less than my impulse-buy threshold of $70. One thing and one thing only met both of those qualifications. It was a flouncy, sheer, peasant shirt that was $69.95. It was not my style and I had no idea what it would go with, but it was fun and I was feeling so very carefree. I marched up to the counter and scoffed at the 2-week return sign on the counter – this shirt was a find! Seven years, two kids and three moves later, the peasant shirt hung sadly in my closet – worn but once to a bridal shower when I horribly mismatched it with some black tailored pants and flowery pumps. Every time I tried to force myself to wear it thereafter, I would change at the last minute. No matter what I tried to wear it with, it just never seemed quite right. Yet there it hung in my closet, year after year. As I flipped through outfit options and my fingers grazed the fabric, I felt a rush of both sentimentality and guilt. Sentimentality for the fun, nostalgic afternoon I spent with a dear friend in a beloved place; guilt for the $69.95 that I flitted away. The sentimental attachment I felt made some sense. Many of my possessions are special because they belonged to a loved one or were purchased on an amazing trip. But in this case, I didn’t need the shirt to connect to the memory or the place or the friend. It was, well, just a shirt. And as for the guilt? Forcing myself to stare at my $69.95 impulse buy every day for years wasn’t going to put the cash back in my wallet. My guess is that some of this sounds familiar to you. Maybe it’s not a shirt – maybe it’s a bowl or a throw pillow or a manual camera you were sure you were going to learn how to use. Everyone makes a purchase decision that they regret from time to time, for a whole slew of emotional or well-intentioned reasons. Holding on to the proverbial peasant shirt out of guilt perpetuates a vicious cycle because it is a constant reminder of the misguided purchase. It is so much healthier to simply let it all go – the guilt and the object. I don’t know what it was that finally made me take the plunge. Perhaps it’s my new profession and the realization that I’ll need to practice what I preach if I’m to coach others through these decisions. Or maybe I was just sick of the space being used in my not-so-huge closet. But a few days ago, after a stare-down with the flouncy, impractical top, I yanked it off its hanger once and for all. It was time to say goodbye. In case you were worried about the shirt’s fate, I’m pleased to say it’s found a home. It now resides with my much younger sister-in-law whose fun, adventurous wardrobe welcomes it with open arms. And now I have an open hanger in my closet, ready for something that will actually make me feel good. It’s a win-win. Next time, it’s not going to take me seven years to get there. This entry was posted in Uncategorized on March 4, 2016 by Avery Amante. I owe my love for order and organization to my mother. Not because she models it, quite the contrary. My mother is a lover of gardening, rug hooking, sewing, baking, and basically creating beautiful things for herself and her loved ones to admire and enjoy. She has so many hobbies and is interested in so many things that the idea of spending time sorting and organizing her stuff… for the birds! Or in her case, for her daughter. 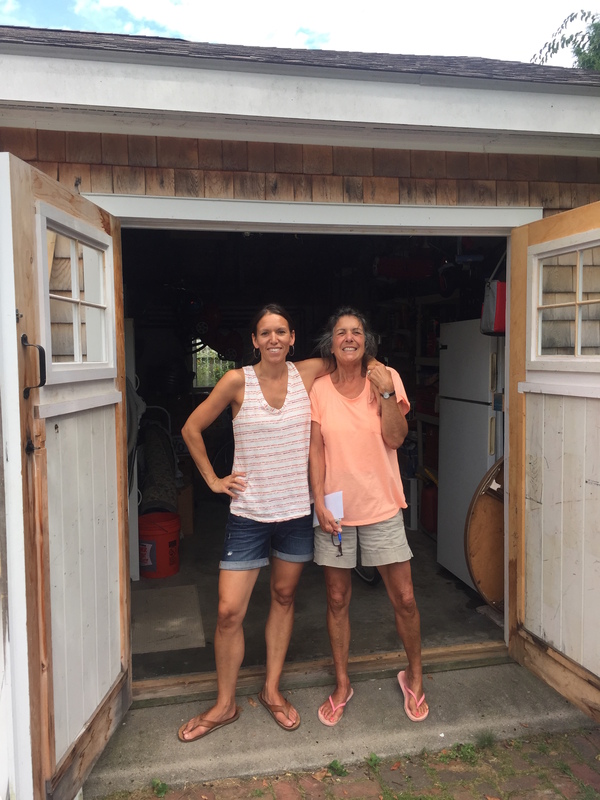 Years ago, my folks downsized from their spacious house in New York to a cottage near the beach that had no attic and no basement. The saving grace was a two-car garage that immediately was designated as storage rather than a place to park cars. It was tight, but it worked… for a little while, anyway. Then my grandmother moved in with them and half of the garage was converted into a bedroom for her. So, add one more person (and all of her stuff), subtract a half a garage. Yikes. The remaining space became a home for bikes, a workbench, tools, woodworking supplies, games, sporting equipment, paint brushes and paint cans, gardening stuff, a refrigerator, overflow food, kitchen items and gadgets, coolers, rakes, life jackets, oars, a lawnmower, a leaf blower… oh, and many boxes of books, framed photos and other sentimental knick-knacks that had come from their previous home. To boot, all of these items lived together in not-so-perfect harmony. You might have to move a snow shovel to get at a beach cooler or find the lobster pot tucked beneath a bag of peat moss. During the summer, when my family and I spend a lot of time there visiting, the garage kept me up at night. I wanted at it. Not only had become a bit of a danger zone (I had stubbed my toe more times than I can count when going in search of a roll of paper towels and I had visions of my two-year-old happening upon a can of paint thinner), but I knew it had potential. Sure there were things that needed to be tossed, but that was only part of it. With a little planning and strategy, the space could be quite functional. Perhaps it would never hold a car, nor would it look like something out of Real Simple magazine, but I had every confidence that it could be a place where like was stored with like and you could find what you needed without risking injury or causing an avalanche of gift boxes in the process. My mom knew it needed to be done, but like many of us, the idea of diving in was far too overwhelming. The first few times I asked if I could help, she resisted. Fear of judgement, shame, and protectiveness over her “stuff” and “systems” prevailed. But when I decided to realize my dream of becoming a professional organizer, I tried again. I told her I needed practice working in someone else’s space to decide if this career path was really for me, and assured her that I would treat her things with the same respect and non-judgment that I would with any other client. After a lot of convincing, she and my father packed up and headed to see her sister in New Jersey, and she let me at it. In the hot August sun, I hauled out every box, every can of paint, every bag of potting soil, the chain saw, the croquet set, the fishing poles, the wood scraps. I sorted, I scrubbed, and I tossed; I made piles for donation and consignment; I took a sledgehammer to a broken shelving unit; I got splinters and cuts; I found hidden gems that had long since been forgotten. And after four days of actual blood, sweat and tears, I put it back together. Food with food, gardening tools and grass seed together, wood scraps pared down and stowed by the work bench, coolers atop the refrigerator, toxic chemicals far out of the reach of curious grandchildren and gift boxes and bags contained to easily accessible bins (no more avalanches!). I proudly surveyed my work; maybe not a masterpiece by anyone else’s standards, but to me, it was beautiful because it was functional. My answer was an unequivocal yes. And then – whether it was the exhaustion or the fact that the garage was now a place of order and function – I fell into a very deep sleep. So thank you to my mother. If it weren’t for her lack of storage space and ample amount of stuff, I never could have been so assured that this was my calling. I may not be thanking her at the Oscar’s, but hopefully my first ever blog post about organizing will make her proud. This entry was posted in Uncategorized on January 22, 2016 by Avery Amante.